Hot Set Tester - EB 16II is made for hot set testing of cable material according to IEC 811-2-1. 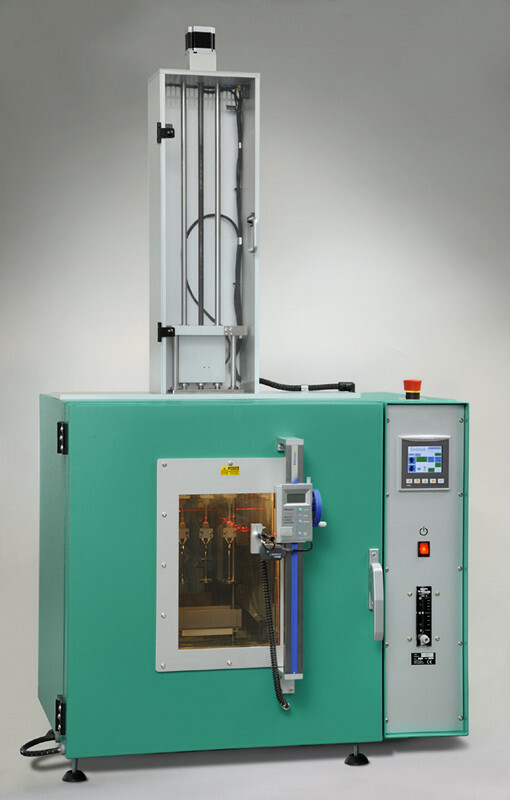 To avoid too high temperature loss when inserting and cutting the samples, the samples are introduced through a small opening in the top of the oven. To get a suitable working height and not shake the samples during insertion, the oven is fixed and the sample holder moves up and down by a servo motor driven screw system. The oven has a controlled air exchange rate and low air speed which can be controlled by a flow meter, meeting the requirements for ageing ovens in IEC 811. Measurements are made through the window with a laser pointer mounted on a measuring scale placed on the door. The window can be taken apart for cleaning. With a push on a button on the scale the measured values are entered in an Excel template, when measuring the elongation. The set is measured outside the oven with a digital caliper also connected to the computer. A finished report can then be produced in Excel.